Fatehpur District in Uttar Pradesh lies between the Ganga and Yamuna rivers, in fact forming the north-east and south-west boundaries of the district. However, the district faces a severe Water scarcity problem and high fluoride in drinking water affects people of this place. Yet, we have Skeletal Fluorosis in this district for the past 10 years ! 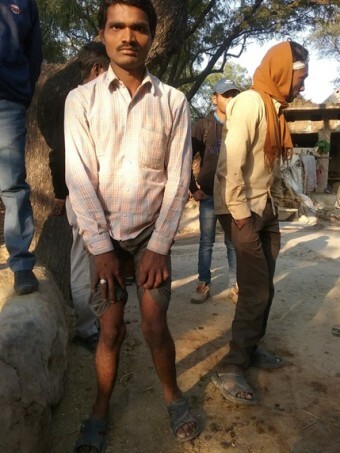 As reported earlier in these pages, Chauhatta is one of the villages of Fatehpur where a long struggle for Fluorosis mitigation has been going on. Water tests conducted here in Chauhatta and in other villages of the district such as Karanpur have shown concentrations of as high as 4 ppm fluoride and more (the standard is 1 ppm). Locally, the issue has garnered much interest. A river activist, Swami Vigyanand with the support of renowned water activist Rajendra Singh recently launched a movement for revival of a local river called Sasur Khaderi-I, partly with the intention of getting water to this village and possibly reducing fluoride. The larger point here is that if Skeletal Fluorosis (deformities of bones) could happen in this area, the problem has been present for more than 10 to 15 years, and yet it does not figure anywhere in the Water quality information system. It is quite a long time, for us to be unaware of a problem in a place which is not too far away in terms of accessibility from the State capital Lucknow and city such as Kanpur. In an earlier story here, we reported how a similar situation in Balasore, Odisha was recognized due to constant efforts from the local Member of Parliament and support from the Fluoride Knowledge and Action Network. However, that is one example of how much effort it takes for a fluoride affected place to get onto the map. There are many such districts in the country having locally recognized problems, yet are not officially designated, and therefore do not figure on the list of programmes. How do these matter? 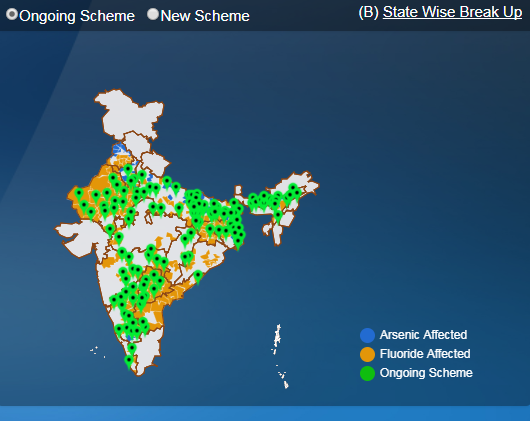 The Government of India has started the National Water Quality Sub-mission to address Fluoride and Arsenic problems of the country’s groundwater. This mission relies on Water quality information data base such as the above one. The NWQSM aims to reach Safe drinking water to 28,000 habitations in the country affected by fluoride and arsenic problems by 2022. The initial mode of Safe drinking water delivery was through perennial Surface water sources, but a recent circular has made it possible to have local Safe water sources or Water treatment as options for drinking water. As of now, the States are responding to the centre with schemes to get supported by the NWQSM. If a village such as Chauhatta, or a district such as Fatehpur do not even get reported in the Water quality data system, they have little chance of receiving Safe drinking water even till 2022. This is not whatstanding the numerous challenges that the NWQSM programme itself faces as of present. We need to start by improving our Water quality information database. This starts with simple analysis and reporting such as this, that builds up an argument for a more transparent and verifiable system. We will reach there with your support by bringing out more such stories. If you want to participate in these Water Data stories, please write to us.